What do you do with the poo is one of the biggest questions people have when they start looking into cloth diapers. What do I do with the soiled cloth diapers when I’m out of the house is probably the next biggest question. I can assure you that if you do it right, you won’t have a stink trailing after you everywhere you go. Thank you to Bambino Mio for sponsoring this post. You want to have a good wet bag. It’s no good if it leaks or smells when it’s closed. Being waterproof is essential. Look for bags that are PUL and have heat or tape sealed seams. You also want something that isn’t too big (because it’ll take up a ton of room in the diaper bag) or too small (it won’t hold enough diapers). Today, I’m going to talk about the Bambino Mio Wet Diaper Bag. It’s approximately 10″ x 10″ when closed, enough space for 3-4 cloth diapers. It is a printed PUL design so you can pick different patterns. The seams are taped to provide total waterproof protection. I love the unique closure! It snaps closed instead of zipping! You’ll need wipes and a way to moisten. I say if you use cloth diapers, cloth wipes are the perfect match! I personally feel, and I’m sure lots of you might agree, that they do a better job at cleaning than a disposable wipe anyway. I always keep a stack of them in a side pocket of the diaper bag. After you use one, they just get tossed in the wet bag right along with the soiled cloth diaper. Next you need to have a way to wet them. I personally recommend a small spray bottle. That way you don’t have to worry about damp cloth wipes molding in the bag or drying out if you don’t use them right away. I have a few homemade cloth wipes solution recipes I really love. The solutions last a few months so you can make it and leave in the reusable spray bottle right in the diaper bag. 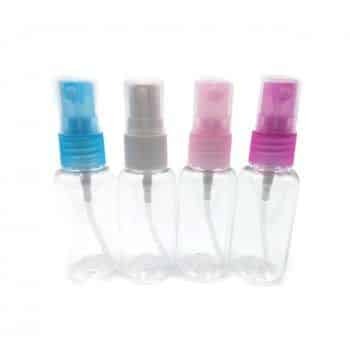 You can find those types of spray bottles at the dollar store or on Amazon. Ok, so what do you do with the poo? There’s two ways to deal with this. First, you can try using a disposable liner. It is placed in the cloth diaper before you put it on baby and goes right on top of the inside. When they go, it is designed to catch the poo before it hits the cloth diaper. You’d just take the whole liner out and dispose of it. Really, no liners should be flushed even if they say they can be. Sewer and septic systems have trouble breaking them down and they can clog the system. To that end you really should shake the poo into the toilet and then throw the liner in a trash can. 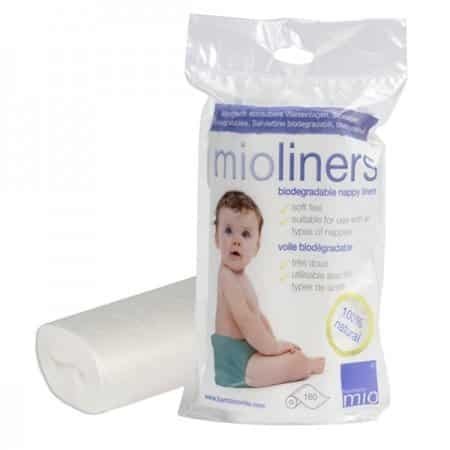 I really like the Bambino Mio mioliners because they are silky soft and break down easily. They are made of Polylactic Acid which is derived from cornstarch. They also seem to provide a stay dry feel which is great if you have a baby sensitive to wetness. The SECOND option for poo on the go is pretty simple. Shake off as much as you can from the cloth diaper into a toilet if it is available. If there are no toilets near by, wrap the diaper up and place it in the wet bag. Close the wet bag. If it’s a good one, you shouldn’t smell anything. When you get home, you handle the soiled cloth diaper the same way you always do. That’s it! Pee diapers are really simple. Remove from baby. Place in wet bag along with any used cloth wipes. Close wet bag. 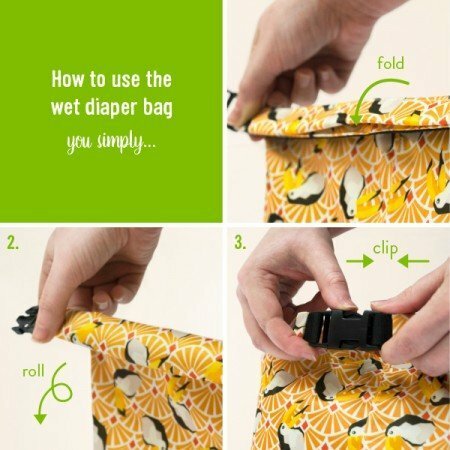 Place wet bag back in diaper bag. Go on with your day. What to do when you get home… Deal with the poo diapers the same way you normally do. The used wet bag can’t really be used again until it is washed (it WILL stink). So you can either just leave soiled pee diapers in that wet bag until washing day. 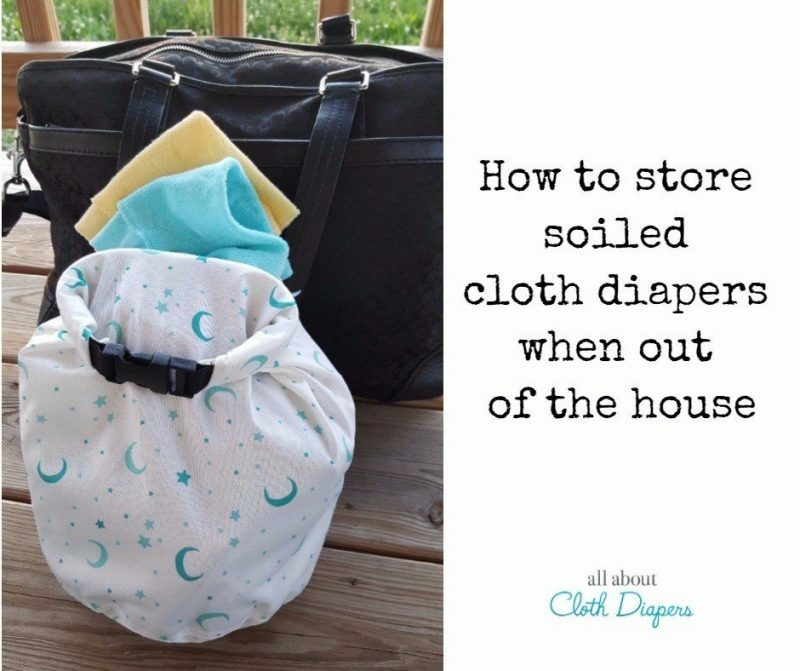 Or you can transfer them to your main soiled diaper storage (pail or wet bag at home). If you need help with washing I have a few great suggestions that should help. Please let me know if you have any questions at all! I’d love to hear how you cloth diaper on the go and what you do for storing them while out and about! Leave a comment and let us know! You can find a Bambino Mio Wet Diaper Bag at https://www.bambinomio.com/. There is now also FREE shipping on all orders over $50!